This article is about the novel by Tolstoy. For other uses, see Anna Karenina (disambiguation). Anna Karenina (Russian: «Анна Каренина», IPA: [ˈanːə kɐˈrʲenʲɪnə]) is a novel by the Russian author Leo Tolstoy, first published in book form in 1878. Many authors consider Anna Karenina the greatest work of literature ever written, and Tolstoy himself called it his first true novel. It was initially released in serial installments from 1873 to 1877 in the periodical The Russian Messenger. Countess Anna Arkadyevna Karenina (Анна Аркадьевна Каренина): Stepan Oblonsky's sister, Karenin's wife and Vronsky's lover. Prince Stepan "Stiva" Arkadyevich Oblonsky (Степан "Стива" Аркадьевич Облонский): a civil servant and Anna's brother, a man about town, 34. His nickname is a Russianized form of Steve. Count Alexei Alexandrovich Karenin (Алексей Александрович Каренин): a senior statesman and Anna's husband, twenty years her senior. Konstantin "Kostya" Dmitrievich Lëvin/Lyovin (Константин Дмитриевич Лёвин): Kitty's suitor, old friend of Stiva, a landowner, 32. Nikolai Dmitrievich Lëvin/Lyovin (Николай Дмитриевич Лёвин): Konstantin's elder brother, an impoverished alcoholic. Sergei Ivanovich Koznyshev (Сергей Иванович Кознышев): Konstantin's half-brother, a celebrated writer, 40. Princess Ekaterina "Kitty" Alexandrovna Shcherbatskaya (Екатерина Александровна Щербацкая): Dolly's younger sister and later Levin's wife, 18. Sergei "Seryozha" Alexeyich Karenin (Сергей "Серёжа" Каренин): Anna and Karenin's son, 9. Anna "Annie": Anna and Vronsky's daughter. Anna Karenina is the tragic story of Countess Anna Karenina, a married noblewoman and socialite, and her affair with the affluent Count Vronsky. The story starts when she arrives in the midst of a family broken up by her brother's unbridled womanizing—something that prefigures her own later situation, though she would experience less tolerance by others. A bachelor, Vronsky is eager to marry Anna if she will agree to leave her husband Count Karenin, a senior government official, but she is vulnerable to the pressures of Russian social norms, the moral laws of the Russian Orthodox Church, her own insecurities, and Karenin's indecision. Although Vronsky and Anna go to Italy, where they can be together, they have trouble making friends. Back in Russia, she is shunned, becoming further isolated and anxious, while Vronsky pursues his social life. Despite Vronsky's reassurances, she grows increasingly possessive and paranoid about his imagined infidelity, fearing loss of control. A parallel story within the novel is that of Konstantin Lëvin or Ljovin, a wealthy country landowner who wants to marry Princess Kitty, sister to Princess Dolly and sister-in-law to Anna's brother Prince Oblonsky. Konstantin has to propose twice before Kitty accepts. The novel details Konstantin's difficulties managing his estate, his eventual marriage, and his struggle to accept the Christian faith, until the birth of his first child. The novel explores a diverse range of topics throughout its approximately one thousand pages. Some of these topics include an evaluation of the feudal system that existed in Russia at the time—politics, not only in the Russian government but also at the level of the individual characters and families, religion, morality, gender and social class. Tolstoy's style in Anna Karenina is considered by many critics to be transitional, forming a bridge between the realist and modernist novel. 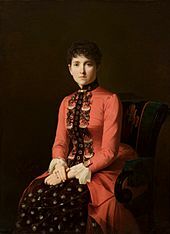 According to Ruth Benson in her book about Tolstoy's heroines, Tolstoy's diaries show how displeased he was with his style and approach to writing in early drafts of Anna Karenina, quoting him as stating, "I loathe what I have written. The galleys of Anna Karenina for the April issue of Russkij Vestnik now lie on my table, and I really don't have the heart to correct them. Everything in them is so rotten, and the whole thing should be rewritten—all that has been printed too—scrapped, and melted down, thrown away, renounced (1876, JI 62: 265)". Anna Karenina is commonly thought to explore the themes of hypocrisy, jealousy, faith, fidelity, family, marriage, society, progress, carnal desire and passion, and the agrarian connection to land in contrast to the lifestyles of the city. Translator Rosemary Edmonds wrote that Tolstoy does not explicitly moralise in the book, but instead allows his themes to emerge naturally from the "vast panorama of Russian life." She also says one of the novel's key messages is that "no one may build their happiness on another's pain." Levin is often considered a semi-autobiographical portrayal of Tolstoy's own beliefs, struggles, and life events. Tolstoy's first name is "Lev," and the Russian surname "Levin" means "of Lev." 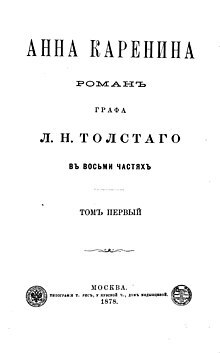 According to footnotes in the Pevear/Volokhonsky translation, the viewpoints Levin supports throughout the novel in his arguments match Tolstoy's outspoken views on the same issues. Moreover, according to W. Gareth Jones, Levin proposed to Kitty in the same way as Tolstoy to Sophia Behrs. Additionally, Levin's request that his fiancée read his diary as a way of disclosing his faults and previous sexual encounters parallels Tolstoy's own requests to his fiancée, Sophia Behrs. The events in the novel take place against the backdrop of rapid transformations as a result of the liberal reforms initiated by Emperor Alexander II of Russia, principal among these the Emancipation reform of 1861, followed by judicial reform, including a jury system; military reforms, the introduction of elected local governments (Zemstvo), the fast development of railroads, banks, industry, telegraph, the rise of new business elites and the decline of the old landed aristocracy, a freer press, the awakening of public opinion, the Pan-Slavism movement, the woman question, volunteering to aid Serbia in its military conflict with the Ottoman Empire in 1876 etc. These contemporary developments are hotly debated by the characters in the novel. The suburban railway station of Obiralovka, where one of the characters commits suicide, is now known as the town of Zheleznodorozhny, Moscow Oblast. Anna Karenin, Translated by Constance Garnett. (1901) Still widely reprinted. Revised by Leonard J. Kent and Nina Berberova (New York: Random House, 1965). Revised version reprinted by Modern Library. Writing in the year 2000, academic Zoja Pavlovskis-Petit compared the different translations of Anna Karenina on the market. Commenting on the revision of Constance Garnett's 1901 translation she says: "The revision (1965) ... by Kent & Berberova (the latter no mean stylist herself) succeeds in 'correcting errors ... tightening the prose, converting Briticisms, and casting light on areas Mrs Garnett did not explore'. Their edition shows an excellent understanding of the details of Tolstoy's world (for instance, the fact that the elaborate coiffure Kitty wears to the ball is not her own hair—a detail that eludes most other translators), and at the same time they use English imaginatively (Kitty's shoes 'delighted her feet' rather than 'seemed to make her feet lighter'—Maude; a paraphrase). ... the purist will be pleased to see Kent & Berberova give all the Russian names in full, as used by the author; any reader will be grateful for the footnotes that elucidate anything not immediately accessible to someone not well acquainted with imperial Russia. This emended Garnett should probably be a reader's first choice." She further comments on the Maudes' translation: "the revised Garnett and the Magarshack versions do better justice to the original, but still, the World's Classics edition (1995) ... offers a very full List of Characters ... and good notes based on the Maudes'." On Edmonds's translation she states: "[it] has the advantage of solid scholarship ... Yet she lacks a true sensitivity for the language ... [leading] to [her] missing many a subtlety." On Carmichael's version she comments: "this is a—rather breezily—readable translation ... but there are errors and misunderstandings, as well as clumsiness." On Magarshack's translation she comments: "[it] offers natural, simple, and direct English prose that is appropriate to Tolstoy's Russian. There is occasional awkwardness ... and imprecision ... but Magarshack understands the text ... and even when unable to translate an idiom closely he renders its real meaning ... This is a good translation." On Wettlin's Soviet version she writes: "steady but uninspired, and sounds like English prose written by a Russian who knows the language but is not completely at home in it. The advantage is that Wettlin misses hardly any cultural detail." In In Quest Of Tolstoy (2008), Hughes McLean devotes a full chapter ("Which English Anna?") comparing different translations of Anna Karenina. His conclusion, after comparing seven translations, is that "the PV [Pevear and Volokhonsky] translation, while perfectly adequate, is in my view not consistently or unequivocally superior to others in the market." He states his recommendations in the last two pages of the survey: "None of the existing translations is actively bad ... One's choice ... must therefore be based on nuances, subtleties, and refinements." He eliminates the Maudes for "disturbing errors" and "did not find either the Margashack or Carmichael ever superior to the others, and the lack of notes is a drawback." On Edmonds's version he states: "her version has no notes at all and all too frequently errs in the direction of making Tolstoy's 'robust awkwardness' conform to the translator's notion of good English style." McLean's recommendations are the Kent–Berberova revision of Garnett's translation and the Pevear and Volokhonsky version. "I consider the GKB [Garnett–Kent–Berberova] a very good version, even though it is based on an out-of-date Russian text. Kent and Berberova did a much more thorough and careful revision of Garnett's translation than Gibian did of the Maude one, and they have supplied fairly full notes, conveniently printed at the bottom of the page." McLean takes Pevear and Volokhonsky to task for not using the best critical text (the "Zaidenshnur–Zhdanov text") and offering flawed notes without consulting C.J. Turner's A Karenina Companion (1993), although he calls their version "certainly a good translation." Reviewing the translations by Bartlett and Schwartz for The New York Times Book Review, Masha Gessen noted that each new translation of Anna Karenina ended up highlighting an aspect of Tolstoy's "variable voice" in the novel, and thus, "The Tolstoy of Garnett... is a monocled British gentleman who is simply incapable of taking his characters as seriously as they take themselves. Pevear and Volokhonsky... created a reasonable, calm storyteller who communicated in conversational American English. Rosamund Bartlett... creates an updated ironic-Brit version of Tolstoy. Marian Schwartz... has produced what is probably the least smooth-talking and most contradictory Tolstoy yet." Gessen found Schwartz's translation to be formally closer to the original Russian, but often weighed down with details as a result; Bartlett's translation, like Pevear and Volokhonsky's, was rendered in more idiomatic English and more readable. The title has been translated as both Anna Karenin and Anna Karenina. The first instance "naturalizes" the Russian name into English, whereas the second is a direct transliteration of the actual Russian name. Vladimir Nabokov explains: "In Russian, a surname ending in a consonant acquires a final 'a' (except for the cases of such names that cannot be declined and except adjectives like OblonskAYA) when designating a woman; but only when the reference is to a female stage performer should English feminise a Russian surname (following a French custom: la Pavlova, 'the Pavlova'). Ivanov's and Karenin's wives are Mrs Ivanov and Mrs Karenin in Britain and the US—not 'Mrs Ivanova' or 'Mrs Karenina'." Nabokov favours the first convention—removing the Russian 'a' to naturalize the name into English—but subsequent translators mostly allow Anna's actual Russian name to stand. Larissa Volokhonsky, herself a Russian, prefers the second option, as did Aylmer and Louise Maude, who lived in Russia for many years and were friends of Tolstoy. Other translators, like Constance Garnett and Rosemary Edmonds, both non-Russians, prefer the first. The novel has been adapted into various media including opera, film, television, ballet, and radio drama. The first film adaptation was released in 1911 but has not survived. 1911: Anna Karenine (1911 film), a Russian adaptation directed by Maurice André Maître. 1977: Anna Karenina, a 1977 ten-episode BBC series, directed by Basil Coleman and starred Nicola Pagett, Eric Porter and Stuart Wilson. 2013: Anna Karenina (2013 film), an English-language Italian/French/Spanish/German/Lithuanian TV co-production by Christian Duguay and starring Vittoria Puccini, Benjamin Sadler and Santiago Cabrera. Alternatively presented as a two-part mini-series or a single 3 hours and 15 minutes film. 1992: Helen Edmundson adapted Anna Karenina for a production by Shared Experience which toured around the UK and internationally; Edmundson won a UK Theatre Award. 1904–1905: Anna Karenina by Italian composer Edoardo Granelli, composed in years 1904–1905. 1905: Anna Karenina by Italian composer Salvatore Sassano on libretto by Antonio Menotti. Opera won a prize at the contest of the Institute for the Advancement of Music, Naples and was premièred by Mercadante Theater in Naples in 1905. 1914: Anna Karénine by French composer Edmond Malherbe, unperformed. 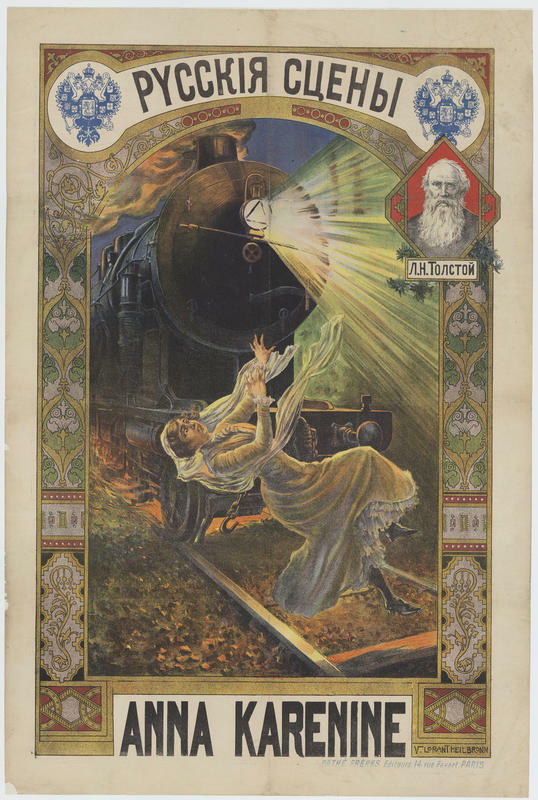 1914: Karenina Anna by Hungarian composer Jenő Hubay on libretto by Sándor Góth and Andor Gábor based on 1907 Edmond Guiraud's French dramatical adaptation. Premièred in 1923. 1924: Anna Karenina by Italian verismo composer Igino Robbiani on libretto by Arturo Rosatto, premièred 1924 at the Teatro Costanzi in Rome. 1930: Anna Karenina, op. 18 by Czech composer Stanislav Goldbach on libretto by Dalibor Chalupa, composed 1927–1930. 1970: Anna Karenina by Ukrainian composer Yuly Sergeyevich Meytus. 1978: Anna Karenina by British composer Iain Hamilton on his own libretto, premièred by ENO at the London Coliseum in 1981. 2007: Anna Karenina, an American opera with music by David Carlson on a libretto by Colin Graham which premiered in 2007 at Florida Grand Opera. Second version with an added scene on text by Mark Streshinsky was premièred in 2010 by Opera San Jose. 2004: Anna Karenina, a ballet choreographed by Alexei Ratmansky, with music by Rodion Shchedrin. 2005: Anna Karenina, a Russian ballet choreographed by Boris Eifman, with music by Tchaikovsky. 2006: Anna Karenina, a ballet in 3 acts choreographed by Terence Kohler (Staatstheater Karlsruhe), music from Shostakovich, Rachmaninoff, Khachaturian. 2014: Anna Karenina, choreography by Christian Spuck (Ballett Zürich), with music mostly by Rachmaninoff and Lutosławski. 2019: Anna Karenina, choreography by Yuri Possokhov, with music from Ilya Demutsky. ^ a b Nabokov, Vladimir (1980). Lectures on Russian Literature. New York: Harvest. p. 137 (note). ISBN 0-15-649591-0. ^ McCrum, Robert (4 March 2007). "Can I make up my own mind?". TheGuardian.com. Retrieved 14 October 2018. The answers to this survey, [What are the 10 Greatest Works of Literature of All Time? ], supply the meat of [The Top Ten: Writers Pick Their Favourite Books], in which Anna Karenina emerges as the All Time Number One Work of Literature. ^ Mandelker, Amy (1996). Framing Anna Karenina : Tolstoy, the woman question, and the Victorian novel. Columbus: Ohio State University Press. p. 241. ISBN 0-8142-0613-1. ^ Ruth Benson. Women in Tolstoy. University of Illinois Press. p. 75. ^ GradeSaver. "Anna Karenina Themes". gradesaver.com. ^ a b Trachtenberg, Jeffrey (Sep 8, 2013). "How Many Times Can a Tale Be Told?". The Wall Street Journal. Retrieved 2013-09-09. ^ Pavlovskis-Petit, Zoja. Entry: Lev Tolstoi, Anna Karenina. Classe, Olive (ed.). Encyclopedia of Literary Translation into English, 2000. London, Chicago: Fitzroy Dearborn Publishers, pp. 1405–06. ^ McLean, Hughes. In Quest Of Tolstoy, Academic Studies Press, 2008, pp. 53–70. ^ McLean, Hughes. In Quest Of Tolstoy, Academic Studies Press, 2008, pp. 54–55. ^ McLean, Hughes. In Quest Of Tolstoy, Academic Studies Press, 2008, p. 69. ^ McLean, Hughes. In Quest Of Tolstoy, Academic Studies Press, 2008, p. 70. ^ a b McLean, Hughes. In Quest Of Tolstoy, Academic Studies Press, 2008, p. 71. ^ Gessen, Masha (24 December 2014). "New Translations of Tolstoy's 'Anna Karenina'". The New York Times. Retrieved 5 April 2015. ^ Makoveeva, Irina (2001). "Cinematic Adaptations of Anna Karenina" (PDF). Studies in Slavic Cultures (2). Archived from the original (pdf) on September 11, 2013. Retrieved August 16, 2013. ^ "Anna Karenina (1911)". IMDB. ^ "Anna Karenina (TV Mini-Series 1977)". IMDb. ^ "Masterpiece Theatre – The Archive – Anna Karenina (1978)". pbs.org. ^ "Amazon.com: Anna Karenina (VHS): Maya Plisetskaya, Alexander Godunov, Yuri Vladimirov, Nina Sorokina, Aleksandr Sedov, M. Sedova, Vladimir Tikhonov, Margarita Pilikhina, Vladimir Papyan, Boris Lvov-Anokhin, Leo Tolstoy: Movies & TV:". Amazon. Retrieved 2012-12-26. ^ "Anna Karenina (1976)". IMDb. Retrieved 2012-12-26. ^ "Edmundson, Helen – Drama Online". dramaonlinelibrary.com. ^ "Nick Hern Books – Helen Edmundson". nickhernbooks.co.uk. ^ "Anna Karenina". Joffrey Ballet. Retrieved 15 February 2019. ^ Morse, Leon (October 22, 1949). "The MGM Theater of the Air". Billboard. Retrieved 25 December 2014. Strakhov, Nikolai, N., "Levin and Social Chaos", in Gibian, ed., (W.W. Norton & Company, New York, 2005). Trainini, Marco, Vendetta, tienimi compagnia. Due vendicatori in «Middlemarch» di George Eliot e «Anna Karenina» di Lev Tolstoj, Milano, Arcipelago Edizioni, 2012, ISBN 88-7695-475-9. This page was last edited on 3 April 2019, at 20:50 (UTC).